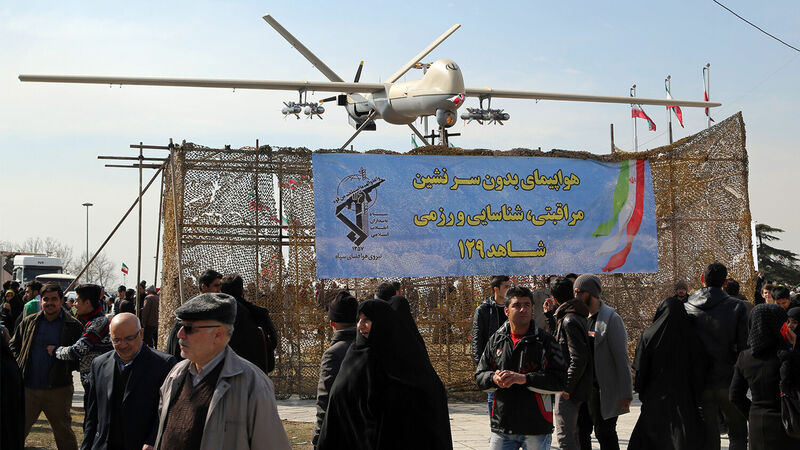 Iranians walk past Iran’s Shahed 129 drone displayed during celebrations in Tehran to mark the 37th anniversary of the Islamic Revolution on Feb. 11, 2016. The push for aerial supremacy is an expression of Iran’s desire to conquer Jerusalem. The Islamic Revolutionary Guard Corps (irgc) held a massive aerial exercise over the Persian Gulf on March 14, in its first large-scale drill using offensive drones, according to the Washington Post. Multiple sources say the 50 Iranian-made Shahed 171 drones, copies of the United States-built RQ-170 Sentinel stealth drone, flew over 620 miles (1,000 kilometers) before successfully striking their intended target on the Bani Farur Island in Iran’s territorial waters in the Persian Gulf. In 2011, Iran captured a downed U.S. RQ-170 Sentinel drone. It immediately went to work reverse engineering it. In November 2014, its first copy—the Shahed 171—modified with bombing capabilities in addition to its reconnaissance capabilities, took its first test flight. On February 12, Israel intercepted an Iranian drone flying in Israeli airspace; it was later determined to be an updated Shahed 171. The Iranian government-influenced Fars News Agency footage below shows Iran infiltrating the U.S. Army’s Command Center and gaining control of a U.S. drone. The drone malfunctioned and crashed into the desert. Uncertain of who was controlling the drone, U.S. forces decided to bomb the drone, destroying it. An Iranian drone flying in the area recorded the footage. Iran’s drone advancements are a crucial aspect of its desire to export terrorism to its various proxy networks. Experts have linked back to Iran various drones from Shiite militias in Iraq, Hezbollah in Lebanon, Quds Force in Syria and Houthi rebels in Yemen. Tasnim has frequently quoted Khamenei saying that Iran “will not hesitate to strengthen its military capabilities.” Iran’s persistence as a major pioneer in drone technology—its capabilities in reverse engineering American military technology—proves this fact. Iran is an extremely aggressive nation with the goal of destroying Israel and conquering Jerusalem. Iran relies heavily on Gen. Qassem Suleimani, head of Iran’s Quds Force, the expeditionary branch of the irgc. Suleimani reports directly to the ayatollah in Tehran and has been instrumental in Iran’s strategy revolving around Jerusalem. Iran will keep pushing to try to conquer Jerusalem (Zechariah 14:2). Even the name of Iran’s “Way to Jerusalem” aerial exercise reveals its desire to take over that city. For more information about Iran’s goal of conquering Jerusalem and the prophesied events leading to that city’s magnificent future, request Mr. Flurry’s free booklet Jerusalem in Prophecy.